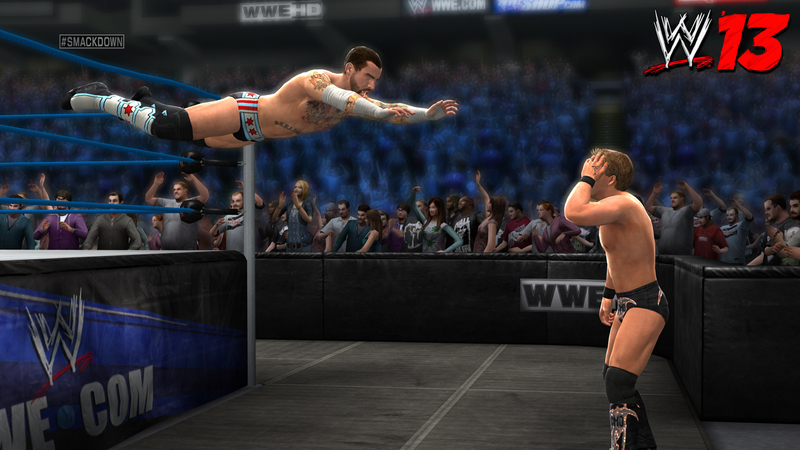 Adjust that attitude and layeth the smackdown as THQ return with another addition to their WWE games series, WWE 13! The latest addition promises to improve on a lot of what plagued WWE 12 along with including new modes and tweaks to make the overall gameplay better. So will WWE 13 get the three count and win the title? Or should it be given several chair shots to the head? So what are the first things we care to notice from this title? The wrestling of course, which I’m glad to say has been tweaked and the physics seem to be looking a lot more realistic, especially when the ring is involved as it seems to react a lot more to the wrestlers that are in it whether its someone getting suplexed and the ring shakes or getting thrown off the turnbuckle and the ropes react. It just raises the experience to a whole other level and brings it ever closer to matching the product we watch on TV. When it comes to the actual wrestling, if there is one skill that I would suggest learning well it’s the skill of reversing your opponent’s attacks. This will surely decide whether you’re still in the match or not however in saying that, you’re opponent could also stomp out your attempts if you become too obvious with your advances. Most attacks can be reversed and you’ll be able to tell when as an indicator will pop up above your wrestlers head. Sometimes big reversals can occur where you dizzy your opponent allowing you to cause some serious damage. Going back to a point I made earlier about not being too obvious with your advances, you actually do get a certain amount of time to do a move so instead of performing an action straight away, delay it for half a second in order to bait your opponent. Another way you could keep yourself unpredictable is making use of a mechanic called the Limb Targeting System which basically allows you to zone in on a specific part of your opponent’s body. This is pretty useful as it allows you the time to choose where you want to attack while at the same time, giving you the opportunity to build up damage on a certain part of the body. It’s almost as if you are given the option to play mind games with your foe adding a sense of strategic thinking to the game. In terms of modes, you have all your standard match types available to you such as TLC and Hell in a Cell; however one of the newest additions this year is the Attitude Era Mode. A true lesson for the crowd who don’t know what it’s about and just pure nostalgia for those who witnessed what probably gave the WWE the success it has now. The main scenarios give us a look at the rise of some of the greatest superstars such as The Undertaker, Stone Cold, Mankind and The Rock, while at the same time you can unlock vintage videos, images and superstars from that time period. As for the matches themselves, you’re given mini objectives to complete in order to pass and these closely resemble the action that happened in the real matches, adding a good sense of accuracy to the game. One cool part of the matches is the Attitude Era moment or for those who weren’t around then, a single moment in the bout that stood out to most people. This triggers when all conditions are met along with a cinematic that can be interacted with via QTE (Quick Time Event). Some of the best matches of the Attitude Era. Universe Mode basically allows you to control everything WWE by editing rosters, controlling matches and basically taking care of every event throughout the year. Create storylines between specific superstars and make even the impossible happen! Believe me when I say that it was quite interesting to see Zack Ryder end The Undertaker’s streak at Wrestlemania but then again that’s the beauty of it. In this mode you can also use superstars and belts from the Attitude Era along with your own created Pay Per View events and wrestlers. Overall I believe that gameplay wise; WWE 13 offers more than enough to keep your interest and make things fun for the player. Yes now and again you would come across the random glitch such as tables not breaking and finishers not connecting however we can be thankful that none of these actually break the game. Taking your skills online would be an obvious step for WWE 13 and while the foundations for gameplay offline are great, online it can be a complete nightmare due to the amount of lag present in all matches. This makes basic game mechanics such as the reversal system become totally useless as timing is completely thrown out of the window and at what speed should you be button mashing to complete or get out of a submission? Online you have a choice between the standard Ranked or Player match options with each offering you something a little different. You can create your own lobbies for matches or while searching for one, select the connection type to suit your preferences. What’s interesting here is that the best chance you could ever get into a match is by looking for a connection which is either 2 bars or lower, already dashing any hopes for smooth gameplay. In Ranked matches you’re playing for points as WWE 13 has this kind of system, where each match you play, you earn prestige points which go towards your ranking on the leaderboards. This all depends on the kind of match you play so for example, a standard one on one bout would not earn you as many points as competing in an Elimination Chamber match. Player matches don’t have points on the line, so in a way you can think of them as friendly games. This is done by searching for available lobbies in which they display the match stipulations and connection types. Funnily enough, I wondered why the Ranked and Player match modes had two different ways of getting into a game? Surely they should both be the same but in this case, the system present in Player matches seems to be a lot more better as you can actually see who’s online and their connections. Compared to its predecessor, WWE 13 has definitely been given an upgrade in the visuals department, now sporting a much sharper and brighter look where superstars and the audience can be seen on a balanced level. The character models seemed to have been given more detail and therefore better represent their actual counterparts. Since the Predator engine has been updated, animations are a lot more fluid therefore resulting in the superstars becoming more lifelike. However if there is any downside to this, it’s the actual crowd themselves who differ hugely in quality compared to the main character models. Of course this is all a balancing act and you can’t have every person in the arena looking amazing however I do feel like the visuals in that area could have been upped a bit. There also do not seem to be enough differing animations in the crowd so it becomes a little awkward when you have a zoomed out camera shot and you see 30 people doing exactly the same thing. The cutscenes themselves I believe were done very well and characters reacted and moved in a very fluid manner. You stole my cookies right!? WWE Live is the new audio system for the game where basically all the sounds you’re hearing have been taken directly from the live events. Crowds seem to be a lot more energetic and pop more at moments when they should such as a favourite’s superstar’s entrance or when someone is performing a finisher; and compared to WWE 12 it’s a huge improvement, however at times I felt that the transition from a quiet crowd to a loud one was a little jumpy and really didn’t have the smoothness that it should. Commentary also didn’t have the same feel that the actual TV show had where I felt at times that there wasn’t enough energy being put into it. A game has big as WWE 13 will obviously have its fair share of glitches, however with this particular title, these glitches seem to show up more so then often and while most of the time it does prove to be hilarious, it also makes me wonder what exactly the QA team where looking at? I guess the only good thing being that none of these glitches are game breaking and things return back to normal after a few seconds. These glitches are not solely from the wrestling itself as it also can affect the visuals from time to time as I once experienced my created superstar losing all its textures and appearing completely black. Lag is a factor I would expect online but not from offline gameplay. Whether this is only from the PlayStation 3 version I can’t be sure however when an abundance of superstars are in the ring and are all performing some sort of move, the frame rate just seems to dip considerably and sometimes this would last for up to 10 seconds. WWE 13 seems to improve on a lot of what plagued the previous title however it still seems to be a series that’s being affected by more than its fair share of glitches. 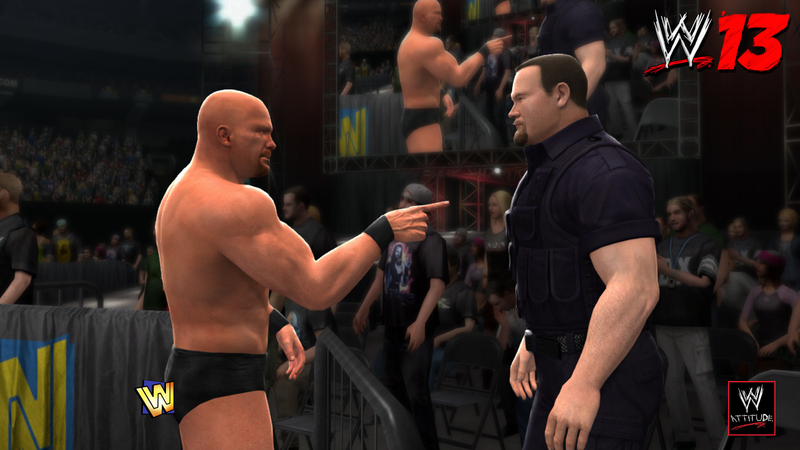 The addition of the Attitude Era mode definitely shook things up and added a lot more depth and history to the game. The new tweaks to the physics makes wrestling in the ring a lot more realistic and improvements to the audio bring it a little bit closer to that live event feel. As of right now, WWE 13 is the best wrestling title to have come out of THQ but on the other hand its one that also doesn’t feel as complete as it should be.